their love and support! 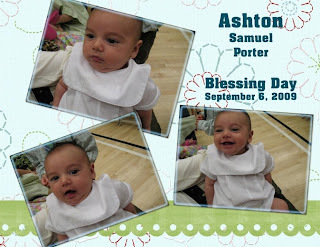 We are so grateful for Ashton and his sweet little spirit in our home. He has brought great joy in our lives! Lindsey, you need to change your profile too. Thanks for sharing this day with us. Also, I sent you an invitation to my other blogpage. That is wonderful his blessing day was so fun. It was a lot of fun seeing your family again. I love seeing the closeness that you have with your sisters. They are great. It was wonderful and thank you for the lunch. It turned out wonderfully.